You sit down in the theater. The film begins. Scene one: A young man in a British Infantry uniform stares across the room of a busy health clinic at a pretty young nurse with auburn hair, bright red lipstick and perfectly styled hair, giving inoculations to other young soldiers. When the young man finally arrives at the nurse’s station, he starts flirting with her in an innocent and adorable fashion. She is annoyed at first, but her defenses slowly start to fall until she gradually gives into his charms. The film then spends about 20 minutes telling how the two young people fall in love, making allusions through flashbacks to the young man’s difficult childhood. After a brief training montage where we learn the quarks and characters of five or six other young soldiers in the young man’s division (plus a salty old sergeant who treats the men roughly in their presence but talks fondly of them to superior officers), the two lovers get married in a rush, as the division is shipping out to fight Germany in the morning. Once the enemy has been properly demonized through a brief scene depicting a particular war crime (executing prisoners, civilians, etc. ), we engage in the second half of the film, a series of gratuitously violent sequences where one after another, the main characters of the division meeting grizzly ends, one-by-one until an expected “last stand” sequence where the young man proves his bravery. There are a plethora of war films of various settings and periods that fit the above archetypal format – Christopher Nolan’s Dunkirk is not one of them. Instead we get a film where there is minimal character development, little melodramatic, inspirational speech and no comprehensive explanation of the historical event being portrayed. Dunkirk is a stark departure from the typical Hollywood formula for World War II movies. Instead of we get a riveting picture of several perspectives from inside the event, one from the beachhead where the British soldiers await rescue, one from the air above the battle where two pilots battle enemy bombers and fighters, and one from the English channel where a father, son and another young man seek to rescue the stranded soldiers from Dunkirk. Before getting into some of the meat of the film, it’s important to review some of the historical details, especially since the film doesn’t really do this. The Battle of Dunkirk (26 May- 4 June, 1940) was fought well into the second year of World War Two. Dunkirk marked a dramatic end to what is now called the “phony war” – referring to the first year or so of officially declared conflict between Germany, France and England where there was a state of war but little open warfare, each side waiting for the other make a move. Eventually in early May of 1940, Germany invaded France, quickly moving past France’s Maginot Line through the “Impenetrable” Ardennes Forest, quickly defeating most of the French Military and cornering the British Army and Navy at Dunkirk. It was there that a perimeter was established and the conjoined forces of the English and French held on for nearly 10 days, awaiting a miracle to evacuate. In many ways, the Battle of Dunkirk wasn’t much of a win. Thousands of British soldiers lost their lives on the beaches and in the English Channel. As Winston Churchill famously declared afterward, “wars are not won by evacuations.” What made Dunkirk a miracle was that so many – in fact, the majority of British troops were saved – and then could be utilized for the long years ahead in fighting the battle that would ultimately topple Hitler’s war machine. 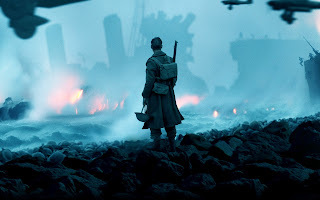 The drama of the situation of Dunkirk is one thing on the IMAX screen (absolutely, positively the best way to see this film), but it’s even more remarkable when one considers that Britain was more or less alone – the US had not entered the war, France was virtually defeated and Russia would be at peace with Germany for the next two years. It’s probable that Hitler wanted to sign a deal with England, but the British weren’t so ready to give in. Their tenacity and stalwartness at hanging on through the storm that was to come is nothing short of epic, and it started with Dunkirk. The film starts with several British soldiers making their way through the deserted streets of Dunkirk. Shots suddenly ring out, striking the men down one by one. However, unlike most contemporary war films, there is little to no gore – the stress is actually put on the sound of the shots rather than the damage of impact. If you’re watching the film in an IMAX theater then you just about jump out of your chair. This sets much of the tone for the rest of the film – falling bombs, torpedoes, and bullets with nary a warning. This creates a tension that you can feel quite profoundly – as if you were aboard a vessel, sitting on a beach, trying to get home along with the soldiers. The sound mixing is vital to the story – added to it by the resolute, foreboding, almost terrifying Hans Zimmer score. These combined qualities make Dunkirk one of the most suspenseful war films ever made. You can feel the terror of a torpedo into the side of your ship, knowing that unless you have a quick exit, you will be sucked under with the ship. As we follow several individuals from shore to ship to sea, the tension grows ever more severe. With minimal character development, Dunkirk relies mostly on visual storytelling to attach us to the main characters. We learn a little bit about some characters at the end of the film, but by and large we don’t who any of these people are beyond the fact that they are all either evacuees, evacuators or defenders of both. But somehow our heartstrings are pulled for them – we can appreciate the desperation of the situation, though most approach it with a typically British emotional dryness. We are scared for each person because they are individually valuable – the pictures of individuals give faces not only to themselves, but to the countless men who are meeting eternity over the course of the battle. An important message is to be taken away – each man is individually valuable, not a mere cog in a machine. Though it’s tempting to think in numbers (as nearly half a million men need evacuation) we’re reminded that the battle is fought by individuals, and each live is significant and valuable because each bears the image of God. Another departure from the expected is the lack of Nazi demonization. As if Nazi Germany needed any more vilification than naturally due, often World War II films will go out of their way (even if completely irreverent to the storyline) to dehumanize Nazi antagonists (think Inglorious Bastards, even Saving Private Ryan to a degree). Dunkirk takes a wholly different approach. Instead, we never really hear who the enemy is – they are referred to as “jerries” once, but never called “Germans” or “Nazis”, instead being referred to consistently as “the enemy”. We actually never really get a good look at any of the “enemy” either. This is an important aspect of the film. Without relying on the demonization/dehumanization of the “enemy”, the film relies on the drama of the situation at Dunkirk. The German Military is the enemy, but they almost become merely an agent of the truly terrifying antagonist: the water. As torpedoes slam into ships and bullets fly into the beach, they become a prod, pushing the soldiers into the water – a cold, faceless, merciless and indifferent enemy, far more terrifying than Germans in trench coats. The message of Dunkirk is mainly what you see – ordinary men placed in extraordinary circumstances – in many ways, horrific situations where their strength, endurance and for many, their faith was put to the test. But it’s also what you don’t see. With almost no contextual historical information given in the film beyond the year and the location of the events, someone who has no familiarity with the events of Dunkirk and the following “Battle of Britain” is hopefully inspired upon its viewing to educate themselves on them. Exiting the theater, I heard a number of people saying things like, “Wow, I can’t believe I never knew about this” and “what war was this again?” This highlights the importance of a film like Dunkirk - not only generating renewed interest in a crucial time in history, but preserving and memorializing in our collective memory the sacrifice of the English (and French) soldiers that eventually made possible the eventual liberation of Europe – all due to a “miracle” of Divine Providence in the salvation of the British Army at Dunkirk.